Our primary menu, at the top of the page, helps you quickly find what you’re looking for. Also, you’ll find that navigating the menu and clicking links is much easier than before. You may also appreciate the new “Government Directory“ page which provides basic information and site links. A clean, open layout minimizes distracting elements and gives priority to its usability by our visitors. Our site is designed to be easy to use on mobile devices such as smartphones or tablets. Most content will adapt to your screen making reading and navigation easier. On smaller screens the navigation menu will transform into a mobile menu as shown in the illustration at right. Also, phone numbers are directly clickable making it much easier to call us from your cellphones. 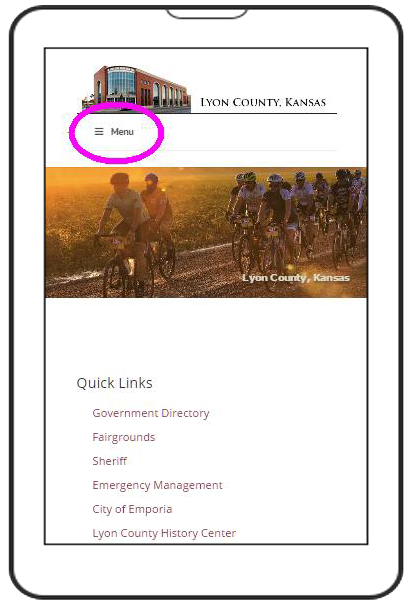 “Quick Link” menus are used throughout the site to make it easy to access the most needed content. PDF documents do not adapt their layout to smaller screen size. The county web sites provide some content and application forms in PDF format. Most modern browsers are now able to open these type of files directly making the installation of 3rd part software, such as Adobe Reader, unnecessary for normal viewing. E-forms (PDF documents which let you fill in areas on using your computer) are also used throughout our sites. On our sites, the use of PDF E-forms does NOT send the entered information back to our systems. This remains private on your computer. Note: our sites may use other types of contact and reservation forms which are intended to collect and send information you provide. E-form documents are intended to facilitate filling out forms for immediate printing using your own printer. It's recommended that e-forms be saved to your computer then reopened and completed in Adobe Reader. This makes it less likely that the typed in data is accidentally lost by clicking on links or leaving the web page. Web browsers and Adobe Reader do not allow you to save completed or partially completed e-forms to your computer. Accomplishing this requires purchase additional software, such as Adobe Acrobat. Our pages now use snippets of area photography to showcase our beautiful area in Kansas. Most images are provided and copyrighted by local photographer, Dave Leiker.